It can take a while to get a case study completed – but isn’t it worth it! Read on . . .
Turner Hire & Sales Ltd have been established in South Yorkshire since 1972 hiring and selling industrial plant from their branches at Rotherham, Wath, Worksop and Sheffield. The company decided they needed to give their customers a clear signal of their desire and determination to provide an even better quality product and service. This led them to look at the international quality management standard ISO 9001 and search for a local consultant. In doing so Managing Director Mick Holmes came across another Rotherham based Chamber member, Pete Thornton-Smith of the 9001 Support Centre at Thornbank on Moorgate, at a Quality Conference in Sheffield back in 2014. They soon struck up a good understanding of the work required and how to ‘make it happen’. Mick makes the point, “I always feel much more comfortable working with local experts and found that whoever I asked, one name kept getting recommended, so Pete was subsequently engaged to work with Quality Manager Helen Hollingworth and began working with Turner Hire late 2014 and we are delighted with the outcome”. “Pete demonstrated a vast amount of knowledge as regards the standard but more importantly, how to work with us to ensure that we installed an effective system that everyone understood. A jargon free area if you will. In addition, we threw him a few curve balls it has to be said, but he calmly dealt with them and returned them with interest”. Mick goes on to say “The certification of compliance with ISO 9001:2008 recognises that the policies, practices and procedures of our firm ensure consistent quality in the product and service that we provide to our customers. With this certification, our customers can be confident that Turner Hire & Sales Ltd is dedicated to maintaining the highest efficiency and responsiveness in achieving our ultimate goal – guaranteed customer satisfaction”. “Achieving the certification was a smooth and natural progression for the company, because it essentially formalised the structures, standards and processes we already had in place. Having gained certification for all our sites at the end of 2015 with ISOQAR, we are in a much stronger position commercially and have been delighted to see the benefits that Pete talked about early on in the project”. Peter and Helen are pictured with the certificate. It goes without saying we would recommend Chamber members to collaborate together as much as they can and if you need 9001 (and 14001 or 18001 for that matter as we do) then Pete’s your man. He really does ‘Lighten the Load’. 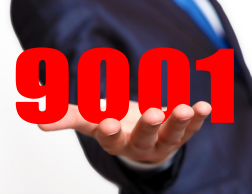 What Would You Want To See In a 9001 App? It is stating the obvious that more and more communications are taking place on mobile devices such as phones to tablets – so why should we Quality Management Specialists miss out? I am in the throws of designing an App with a colleague here in the UK that I feel will add value to those running a QMS – but I would love to know what you think should be included. Given all that a QMS has to cover, what are the major elements you think would look good in the palm of your hand. Whilst this will work really well for CPD purposes for yourself, also think of practical issues where having that information or form on a mobile device would really add value. You can make use of simple text, pictures, audio, video, surveys, email and more so don’t feel there are any limitations – make the suggestion and leave it for us to decide if it is doable. The plan is to launch it in September and I’ll make sure you have the opportunity to be first in queue when it is ready to download. Looking ahead, there are already some exciting ideas getting short-listed so please give me some feedback here so we can consider yours. It will get credited if it is included. First off, I need to say a quick ‘welcome’ to the new members of this group. Many thanks for coming on board after seeing the blog. This is where we kick around some fresh ideas about 9001. Now this time, instead of telling a story in the usual format, I have decided to throw a case study into the mix. Let’s see how well you respond to the challenge of actually putting your knowledge into practice. It’s just a bit of fun but, in all seriousness, I am sure you like me want to keep your skills honed and there is no better way in my opinion. a. Would you raise a CAR based on what you know already and if so what would it be and which paragraph would you raise it against. b. Are there any other areas where you are thinking there is a possible CAR but would seek out more evidence before making a decision? The company is a single site and fabricates cabinets out of metal sheet by using a computerised laser cutting machine; a forming press; general machining and TIG and MIG welding. You discuss the control of documents with the QA Representative and start by asking to see the Index and Change Control system. You are handed the Quality Manual and told that the index is at the back in an appendix. You verify a list of procedures only but note that there is no revision number included, only the title. When you query this you are told “Well if we added that then every time we amend a procedure then we would have to amend the manual which would be a real bind”. When you ask if there is any other document containing this information then you are told “No, we’ve always done it that way”. You ask to see a copy of the relevant procedure for Document Control but are told they have never been told they need one which is when you spot it is not on the list. You enquire as to how the procedures are authorised and reviewed before issue and how the company then communicates with staff that amendments have been made. You are shown that each procedure has the author’s name typed into the footer of each procedure with the date of issue and that staff aren’t told of amendments. New or amended procedures are filed in the main binder with a copy in each of the 4 departmental binders (Sales and Purchasing office, Drawing office, Warehouse and shop floor) and the old version shredded. I look forward to hearing your opinions and I will send an Amazon voucher as a thank you to whoever I feel puts together the best case. Make your Quality stand out!